Discussion in 'Masonic Blogs' started by My Freemasonry, Jun 8, 2011. 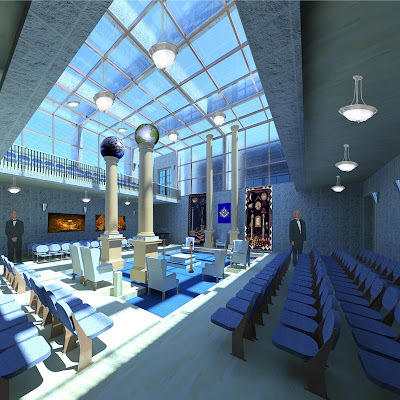 Brother Charles Lloyd Mashburn Jr. from Savannah, Georgia has an interesting website to showcase his design concepts for modern Masonic architecture. His Progressive Masonic Architecture site proposes "Architecture that expresses the Masonic ideas of 'Education, Knowledge, Unity, & Masonic Light' in a visual & physical form." The site has renderings of several of his original concepts for large Masonic spaces: a Universal Temple of Freemasonry in Jerusalem; a North Texas Masonic Historical Museum and Library, and an exterior treatment for Thunderbolt Lodge No. 693 in Georgia.